The Pouch Cove drawings were made while I was in residence at Pouch Cove in Newfoundland, Canada. I used Prussian blue gouache and a wet into wet technique, striving to capture a moment of time whether observed or imagined. For me the color signifies this sense of place as it relates to the raw landscape and feel of the region. 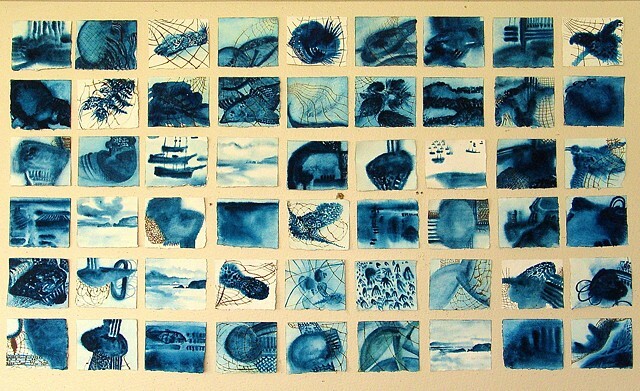 It was my admiration of cyanotypes that first brought me to use the intense hue of Prussian blue. All of the drawings reference a life of living in the midst of the Atlantic Ocean and the Gulf of the Saint Lawrence River. In Scottish Gaelic, Newfoundland was called Eilean a' Trosg, or literally, Island of the Cod.